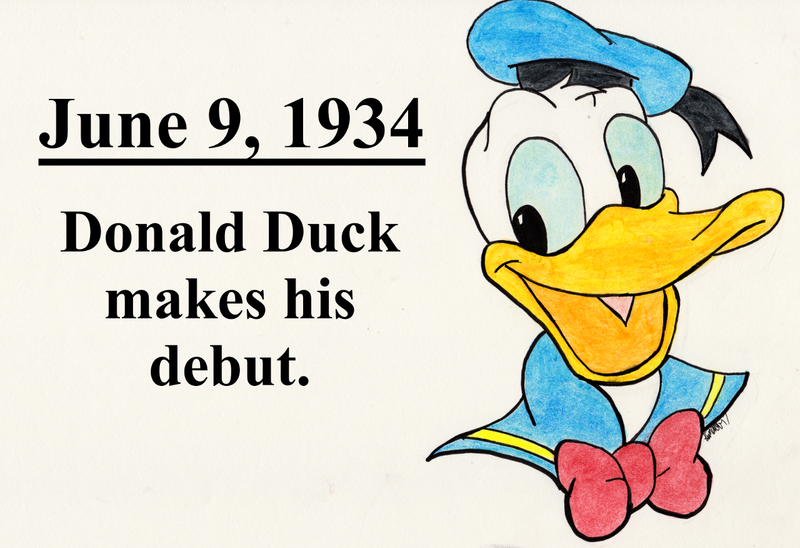 On June 9, 1934, cartoon and comic character Donald Duck makes his debut in the animated short The Wise Little Hen. Donald with his ill-temper and hot-headed demeanor proved to be an excellent foil to the companies star Mickey Mouse. From his beginnings in early Disney animated shorts, Donald Duck has risen to world-class celebrity. He has appeared in more films, including shorts, than any other Disney character is the 5th most published comic book character in the world, rising to number one outside of the superhero genre. He also starred in a number of propaganda films during World War II, including Der Fuehrer's Face which won an Academy Award for Animated Short Film in 1942. It was during this time Donald was also drafted in the US Army in a series of short films which showed his experiences in the Army from being drafted to participating in a commando raid against a Japanese airfield. His appearances in these films resulted in many an American warplane featuring the image Donald Duck including B-25 "Ruptured Duck" which took part in the Doolittle Raid on Tokyo. Donald Duck remains to this day one of the greatest and most iconic cartoon and comic book characters in existence.